On Saturday 17 August, 170 volunteers donned their gumboots to plant 3,000 native trees and shrubs at Napier’s Ahuriri Estuary. Each region’s planting project is dedicated to a local “Rugby Legend”. Ian MacRae was selected by Hawke’s Bay Rugby Union as the Hawke’s Bay Rugby Legend in 2011. Ahuriri Estuary is an extensive estuary which is home to a wide diversity of shore birds. With the formation of cycling and walking tracks it is becoming increasingly used for recreation. The Living Legends project has established over 10,000 plants in two areas providing security and habitat for wading birds along the farmland edge and re-vegetating the railway embankment. Maintenance of the plantings that have been completed by Living Legends will now be handed over to the Department of Conservation. On Saturday 17 August, 80 volunteers donned their gumboots to plant 4,500 native trees and shrubs at Long Bay Regional Park. Each region’s planting project is dedicated to a local “Rugby Legend”. Buck Shelford was selected by North Harbour Rugby Union as the local Rugby Legend in 2011. Long Bay Regional Park is a popular recreation area for Aucklanders, attracting over a million visitors a year with its sweeping beach which adjoins a marine reserve and contains stands of native forest. It’s home to a significant area of coastal forest with a canopy of pohutukawa, puriri, and taraire. The Living Legends plantings on this extensive wetland/pasture will complement the great efforts already undertaken by the Park’s community supporters. Living Legends is pleased to have contributed 14,000 plants to this very popular recreation area. Maintenance of the plantings that have been completed by Living Legends will now be handed over to Auckland Council. 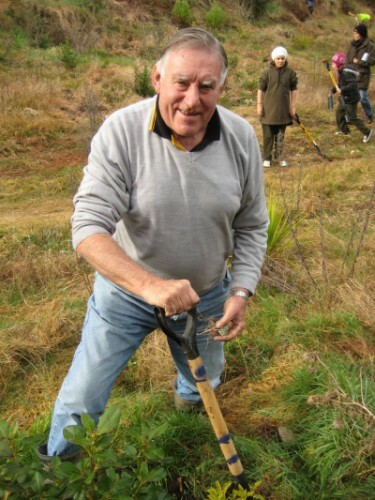 Rugby Legends such as Buck Shelford, Sir Brian Lochore and John Sturgeon will be donning their gumboots and planting trees alongside thousands of New Zealanders for the last year of Living Legends events in August 2013. Living Legends is a community conservation project that was set up in 2011 to leave a legacy of New Zealand’s hosting of Rugby World Cup. So far more almost 130,000 native trees have been planted across 17 locations throughout New Zealand. A total of 170,000 trees will be planted at the conclusion of this year’s events. Devon McLean, Project Manager of Living Legends says that as well as celebrating rugby, the project will contribute hugely to conservation in New Zealand. “We’re very proud of our commitment to helping to restore New Zealand’s bio-diversity with our Rugby Legends. Living Legends was established as an opportunity for people to get involved in the restoration of native tree populations alongside Rugby Legends in their local community” says Devon McLean, Project Manager for Living Legends. “We look forward to reaching our target of 170,000 native trees being planted by the end of this year’s events”. 17 Rugby Legends including Sir Colin Meads, John Sturgeon and Bryan Williams have joined over 6,500 New Zealanders to plant more than 120,000 native trees as part of the Living Legends project so far. Living Legends is a community conservation project that was established in 2011 to celebrate and leave a legacy of New Zealand’s hosting of Rugby World Cup. It is a five year project that will eventually see 170,000 native trees planted throughout New Zealand. A staggering 129,140 native trees have been planted so far. Living Legends planting events will return next year, with dates and locations to be announced in early 2013. Rugby Legend John Sturgeon joined forces with around 80 local volunteers to help plant 2500 native trees in Punakaiki on Saturday 25 August. This effort was part of the Living Legends project’s West Coast planting day for 2012. Living Legends has been planting at the Punakaiki Coastal Restoration area and with the help of our volunteers and Rugby Legend John Sturgeon, we have now planted a total of 7500 native trees at the this site. 5000 were planted during Rugby World Cup in 2011 and 2500 in 2012. 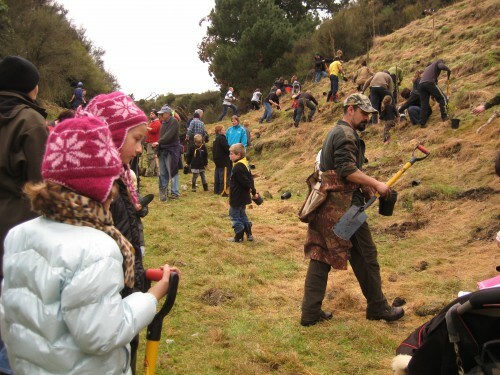 John Sturgeon was selected as the West Coast Rugby Legend in 2011 and spent the day at Punakaiki mucking in with local volunteers from the community, including kids from Runanga School, planting native trees. John will return with Living Legends to continue planting at the Punakaiki Coastal Restoration area in 2013. 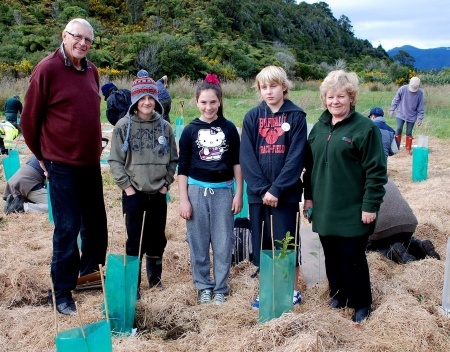 Thousands of New Zealanders have now helped to plant over 100,000 native trees as part of the Living Legends project. Living Legends is a community conservation project that was established in 2011 to celebrate and leave a legacy of New Zealand’s hosting of Rugby World Cup. It is a five year project that will eventually see 170,000 native trees planted through public planting events held every year. A staggering 110,350 native trees have been planted so far, with a further 18,000 to be planted this year. There are 17 planting projects around New Zealand and each is dedicated to a Rugby Legend from the region. These include rugby greats such as Sir Colin Meads, Buck Shelford and Todd Blackadder. “Reaching the 100,000 trees mark is a huge milestone. We’re very proud of our commitment to helping to restore New Zealand’s bio-diversity with our Rugby Legends. Living Legends was established as an opportunity for people to get involved in the restoration of native tree populations alongside Rugby Legends in their local community” says Devon McLean, Project Manager for Living Legends. “We look forward to seeing the next 18,000 trees being planted over the next two weeks”. There is still opportunity for people to get involved with a local planting project this year, with events to be held this weekend in Wellington, Punakaiki, Tauranga and next weekend in Otago, Southland, Manawatu and Waikato. Living Legends is a joint venture of Project Crimson, an environmental charity with 22 years experience in community-based native restoration projects and The Tindall Foundation. Major sponsors are the Department of Conservation and Meridian Energy.